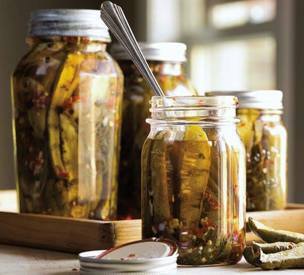 What are grilled pickles? They do sound odd, but trust me, they’re delicious! You take cucumbers and onion, grill them until they have a good amount of smoke and char, and then make homemade quick pickles with them. They’re really beautiful and make excellent gifts. When people come to dinner, I like to set the pickles out in the center of the table as a sort of centerpiece—they’re so much better than flowers because you can eat them!